Last August, a video of one teenage girl pushing another off a 50-foot bridge quickly went viral. 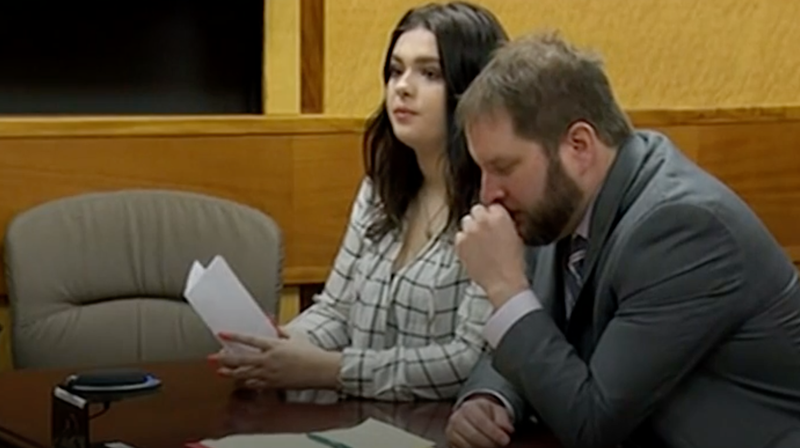 On March 27, Tay’lor Smith was sentenced to two days in jail after pleading guilty to reckless endangerment for causing her former friend to fall five stories. Jordan Holgerson was 16 when Smith pushed her off a bridge at Moulton Falls in Yacolt, Washington. Video of the incident shows Holgerson saying “No, I won’t go in.” It was her first time on the bridge, a popular spot for swimmers to jump into the water despite signs prohibiting it. Video shows Holgerson being pushed from behind. She hit the water after falling over 50 feet, breaking five ribs, puncturing both lungs, and requiring a three-day hospital stay. In court, Holgerson’s mother asked the judge to sentence Smith to as many days as her daughter spent in the hospital. Smith was eventually sentenced to two days in jail, 38 days on a work crew, and a $300 fine. In an interview with Good Morning America before she was charged, Smith says Holgerson asked Smith to push her if she couldn’t work up the courage to jump, but Holgerson denies that conversation happened, and that’s still no reason to push anyone off a bridge. In court, Smith apologized for the pain and humiliation she’s caused.